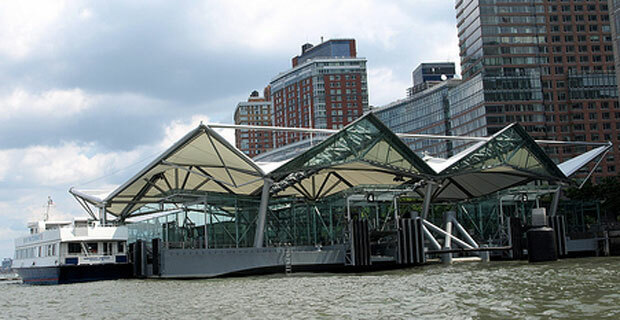 Battery Park City Residents are fed up with the sounds of "Frank Sinatra"
The “Frank Sinatra” and the “Yogi Berra” are just two of the ferry boats that illicit unending complaints from Battery Park City residents for nearly eight months. The vessels shuttle commuters from New Jersey to Battery Park City mostly for the service of Goldman Sachs employees who moved its corporate headquarters to our neighborhood almost a year ago. The public transportation nightmare has caused headaches for residents closest to the ferry terminal for some time. The ferries shuttle commuters more frequently than most other ferry services in the area during normal rush hours; however, the ferries also operate outside of those hours primarily for Goldman Sachs employees. The noise that emanates from the commuter ferries are due to older vessels being used to keep up with the increased commuter use as well as the siren signals heard when arriving and leaving the ferry terminal. To alleviate the public problem, a private wallet has emerged — Goldman Sachs has agreed to spend $5 million dollars to provide updated ferries that would alleviate the noise pollution. Goldman had been quick to “bridle at the complaints, suggesting that the neighbors were piling criticism on a firm that has already been faulted in the public eye,” as mentioned in the same article. For those who don’t know, Goldman might be referencing our neighborhoods tested and fractured relationship that started with their construction woes nearly two years ago. Falling glass and debris from the construction site had been known to fall upon our community ball fields and sidewalks, injuring one of their own architects, as well as the community outcry for the recent closings of several retail and restaurants in our area. How do you feel about Goldman Sachs’ offer to our community for new ferryboats? Does the ferry noise affect you? The “Christopher Columbus” appears to be the loudest of the Goldman ferries. From November – February the three ferries would wake me up at 5:50 am almost every weekday. It’s been better since then because it seems that they don’t run these particular ferries early in the morning anymore (6 – 8am) or they dock them on the north side of the terminal at these times. After this time, on days that I’m not at work, I see them dock on the south side. I assume it’s still an annoyance for anyone that works from home. I actually work from home in my apartment in Gateway. My window faces north on the Hudson right into the eye line of the ferry dock. I have to say that i hardly notice the noise anymore. Yet, what does spark my attention is when it gets quit, during the lulls of the boats coming and going. SO I guess it IS a problem! Actually, it’s not the SOUNDS of the ferries that concern me – I lived at 50 Murray Street for 6 years, constantly bombarded by police & fire sirens, rumbling trucks, blaring horns and by contrast, BPC is positively idyllic – it’s the diesel fuel exhaust blasting onto the walkways and parks that really need attention. If Goldman Sachs is willing to invest in ferry improvements, that’s fantastic. As anyone knows, NY Waterways has been operating at a deficit for years now and could use an infusion of capital. It provides an invaluable service for both workers and residents alike so let’s seek solutions rather than complain about minor annoyances. NY Waterways is a privately owned company and not part of the Port Authority. Personally I can’t hear the ferries over all the WTC construction noise.